I made myself this quick little bento to eat before swimming lessons. We have a busy day tomorrow and I have to fast for a blood test. starting now! It's going to be a quick turnaround from my Dr's appointment to swimming lessons tomorrow morning and I know that I will be starving by then! 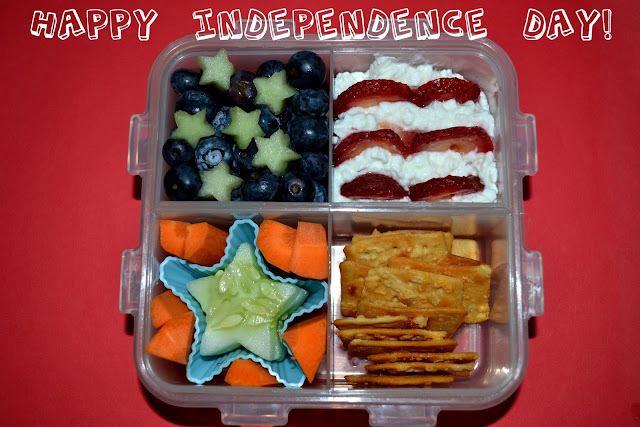 I packed myself - grapes (hidden), blueberries, honeydew mini stars, cottage cheese with one sliced strawberry, carrots and cucumbers from our garden and some Baked Naturals cheddar crackers.